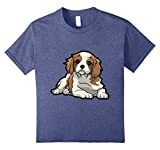 The soft gentle expression, floppy ears and friendly, wagging tail are hallmarks of the English Springer Spaniel, widely recognized to be one of the world’s most friendly and least aggressive breed of dog. As much a sporting and hunting dog as it is a family dog, the English Springer Spaniel is an excellent companion for game and bird hunters, with the English Springer Spaniel regularly being taken on hunts up and down the country. A tireless worker, the English Springer Spaniel takes to their duties with vast endurance and tenacity and is probably the best breed of dog for any sportsman who wants a great all-around gundog. How Much Should a Springer Spaniel Weigh? The weight of a healthy English Springer Spaniel depends on the dog’s gender. A female dog should weigh around 20kg and be around 43cm tall. The actual weight of your English Springer Spaniel may fluctuate around these figures, and one or two kilos either under or overweight is nothing to be concerned about, particularly if your English Springer Spaniel is smaller in stature. Canine obesity is a major epidemic at the moment, though, and is causing many doting pet owners a lot of undue stress. If your English Springer Spaniel weighs drastically more than the above weight, it may be time to address the problems which are causing the excess weight. There are many factors which can cause your dog to put on some extra pounds. Your dog being overweight is a serious matter and it is something which you need to address before it turns into a major problem. A lack of exercise. 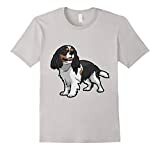 This is particularly applicable to the English Springer Spaniel, which is a lively breed of dog. They require lots of intense exercise (long walks and running) and will quickly put on weight if this doesn’t happen. Too much food, or the wrong type of food, is the second most common reason dogs put on a bit (or a lot) of excess weight. It is important to choose the right kind of food for your dog breed to ensure they are getting the right nutrition and avoid problems with obesity. A dog’s age can also cause obesity. As dogs get older, they become more inactive as they no longer have the energy or endurance to be as active as they once were. Although this cannot be helped, you can buy specially formulated mature dog food which is lower in calories to keep the weight off. The ideal weight of an English Springer Spaniel is around 20kg (females) or 25kg (males). As they are quite an active breed of dog, there is rarely a problem with obesity, however, there are exceptions to this rule. If your English Springer Spaniel is looking a little podgy, perhaps it is time for some dietary or lifestyle changes.